Welcome back to Badge Busters, ladies and gentlemen! 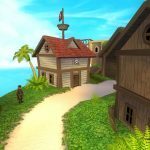 Last time, we covered the very first world of the Spiral—Wizard City—and went over the literal dozens of badges to be acquired there! This time, we’re heading over to the ruins of Krokotopia. Hope you don’t mind the sand, because this place has a total of 16 badges up for grabs! For those of you who are new here, this is the second part of a series where I tackle the various badges in each world and discuss how to get them. For the first part on Wizard City’s badges, click here! Now introducing the Other category! This category will be dedicated to badges that don’t really fall under any other category (such as travelling to certain places, completing certain tasks, etc. ), so they will be relegated here. Upon entering the Oasis, take a left into the shopping area. Make another left and you’ll find yourself face-to-face with a pair of obelisks and a teleporter. See those little red circles on the obelisk? Every 10 minutes or so, one of those circles will light up. 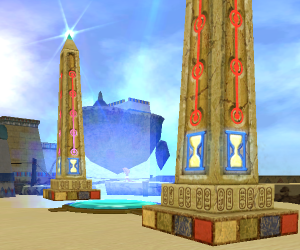 Once all five are lit, the tips of the obelisks will glow, opening up the teleporter. Step in and you’ll be whisked away to the secret shop! Once you’re there, go into the shop and run around in it a bit. No purchases necessary! Exit, then repeat 4 more times. Do all this, and you should get the badge no problem! Also, quick heads-up: If you’re a Conjurer, GO SEE THIS GUY. 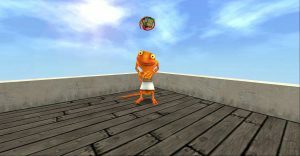 He is on the top of the secret shop, and he has a TON of free spells for you. You won’t get the Master of Monsters badge unless you do! And, last but not least, everyone’s favorite kind of badge: the Enemy Smasher. Thankfully, Krokotopia has only two categories to hunt after in this regard—Krokotopians and Spiders. Thus, acquiring these won’t be NEARLY as painful as the Badges in Wizard City. Hey, wanna hear something interesting? 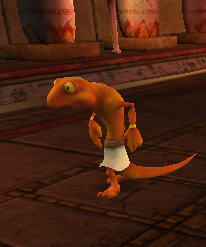 Despite only showing Kroks on the badge icons, Manders (and a few Elementals, funny enough) count as Krokotopians too! 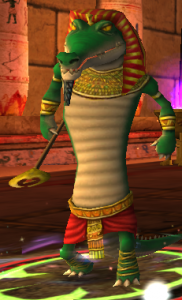 Literally the first enemy you ever fight in Krokotopia—the Charmed Slave in the Royal Hall—counts as a Krokotopian. If you want easy pickings, they’re your guy! …Or girl. I won’t assume. Spiders. Are. EVERYWHERE. No, seriously. 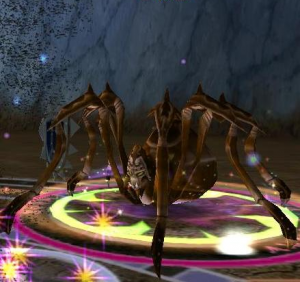 You can find enemies that classify as Spiders scattered in almost every dusty corner of the Spiral; getting up to Web Cutter (100 Spiders) should be a cinch, and you probably wouldn’t have to go far out of your way to get Chitin Crusher (250 Spiders). That being said, if you really wanna be a Spiderbane, Krokotopia has plenty of these creepy-crawlies to spare, but you’ll find a much more concentrated population of arachnids between the Webwood Creepers and Webwood Scuttlers in Grizzleheim’s Savarstaad Pass***. Happy squishing! 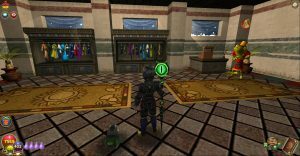 This part’s shoutout goes to the Ahnic Strider, a common enemy patrolling the halls of the Ahnic Family Tomb in the Tomb of Storms. 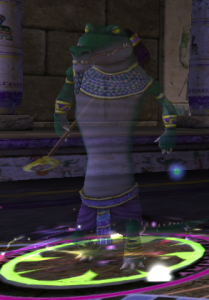 While these guys may be a bit tougher than Charmed Slaves, they count as both Krokotopian and Undead; if you want to double-dip for both the Krokotopian and Undead Enemy Smashers, these ghostly gators have got you covered! ** Something I really like about the Master of the Oasis badge is that it’s kind of a culmination of the three badges that came before it, those being Junior Archaeologist, Krokosphinx Delver, and Tomb Raider. 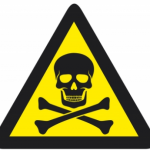 We’ll be seeing more of these kinds of badges in the future. *** Technically speaking, the area the Webwood Scuttlers and Creepers are in is called the Webwood. For simplicity’s sake, however, I’m referring to the area as Savarstaad Pass, as Webwood is just a part of the larger whole. And with that, another episode of Badge Busters is concluded! 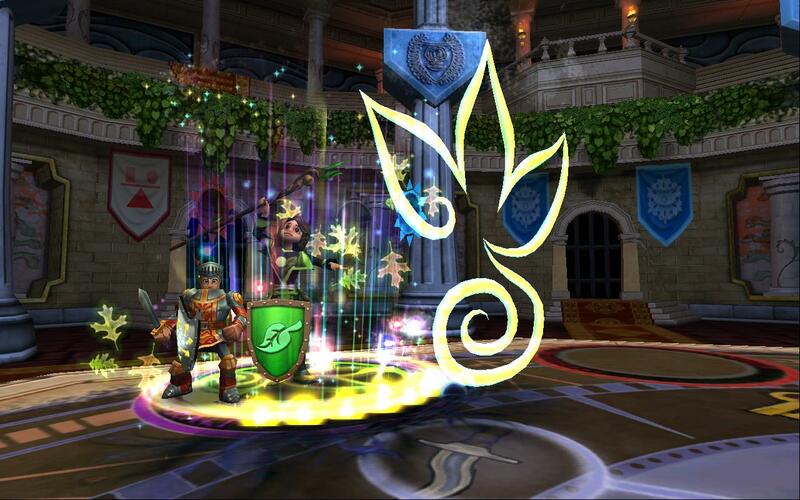 Join us next time as we venture into Marleybone! A longtime denizen of the Spiral, James Earthwalker has plenty of stories to tell of his adventures and experiences. If he's not busy ranting over Critical Block being ruined post-Polaris, you can find James either hunting down Badges or writing more opinion-based pieces for his series The Spiral Notebook.